Looking for something longer, wider and beefier than our residential aluminum gangways? We utilize a variety of different shapes to create a tailor made solution for our more demanding customers. Our capabilities include widths of at least 8′, spans over 100′ and live loads of 100+ psf. Alumadock commercial gangways can be constructed from many different profiles to form a finished product that best suits the needs of the customer. 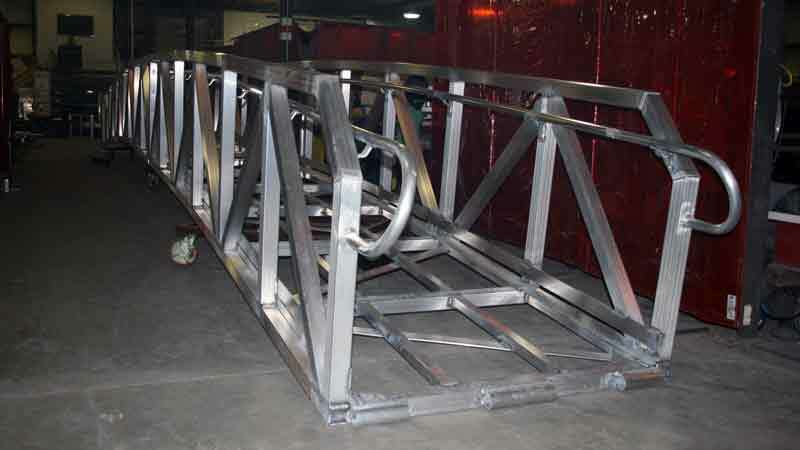 Square 3×3 or 4×4 tubing is utilized on the majority of our long span, high load gangways. All gangway construction is 6000 series aluminum and all fasteners 300 series stainless steel, for the most corrosive resistant end product. In some situations, we anodize or powder coat the gangway for even more protection from the harshest of industrial or environmental conditions. With 8′ widths, you can easily fit two wheelchairs, multiple people, oversized furniture and other large items and even golf carts! 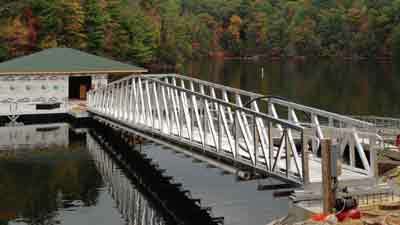 Length is not a problem either with Alumadock commercial gangways. Single spans of at least 100′ with custom spans available, we can build whatever the site and customer require. Normal commercial live load ratings of 100 pounds per square foot standard, with even higher ratings available. Get your gangway quote today! 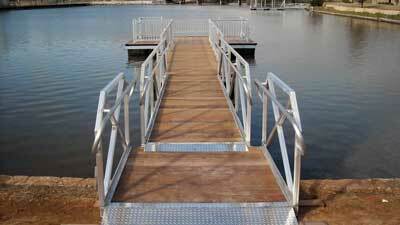 Alumadock customizes each gangway to suit the needs and requirements of the customer. We utilize heavy duty connection methods on all commercial gangways, developed in house with approval by our PE. Standard bulkhead plates, 5th wheel and roller connections allow a secure anchoring with an easy installation. We offer ADA compliant gangways in any length or width too. 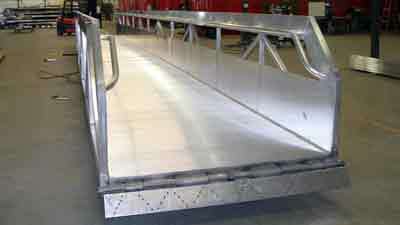 Top rail, mid rail and toe kick are standard features on all Alumadock ADA commercial gangways. Slope requirements vary based on end use of the gangway, but Alumadock will help you sort through what’s needed! ADA compliant handicap ramps and transition plates help smooth the gangway’s termination into shore or dock, providing a safe and accessible route for everyone.